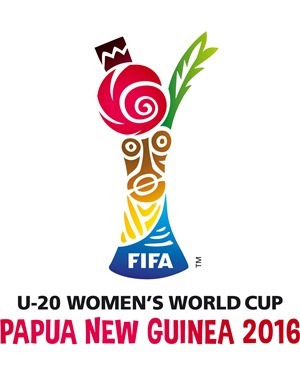 The Official Emblem and Slogan for the FIFA U-20 Women’s World Cup 2016 was unveiled in an event held today, 8 March, at the Laguna Hotel in Port Moresby. The event coincided with International Women’s Day, which was a perfect fit for the tournament that aims to inspire and encourage girls and women through football. The eighth edition of the competition, which will be held from 13 November to 3 December, will take place in Papua New Guinea’s capital, Port Moresby. The Official Emblem connects Papua New Guinean culture to the tournament by utilising the recognisable shape of the Official Trophy of the FIFA U-20 Women’s World Cup as a canvas, and incorporating the country’s heritage and nature through a range of design and colour elements. The Official Slogan for the tournament was created in order to inspire and empower young women across Papua New Guinea. “To Inspire, To Excel” encapsulates the ultimate goal of the event, which is to use football as a platform to push for gender equality in a traditional male-dominated culture. “Gender equality remains a significant social challenge in Papua New Guinea but we hope that through this tournament we will create further awareness and promote change towards a more egalitarian society,” said David Chung, President of the Papua New Guinea Football Association. Along with the Official Emblem and Slogan, the Official Look for the tournament was also released today, which takes graphic elements from traditional Papua New Guinean designs. The Official Look is a flexible asset that visually connects all parts of the tournament, from the event materials to stadium dressing and across various other platforms.